Well, Six hours later, and we’re still in the middle of the NBA lockout. Not that I expected David Stern, Adam Silver and Derek Fisher to fix everything and give up on billions of dollars in six hours. But still, at least according to what they’re saying or probably what they’re not saying, we’re not any closer to end the work dispute and get the 2011-2012 NBA season going. Maybe it’s a good thing for the NBA that the NFL is starting in a week. Maybe it’s bad. The lockout is flying under the radar as the sportsnation rejoices that Football won’t be out this autumn or summer, differing on where you live. Not enough pressure from fans and media for the sides to sit down. Maybe it helps, making it easier for the sides to meet without all the hoopla around. The meetings will now be reduced to probably these six people – Stern, Silver and Peter Holt (owner of the Spurs) on the side of the league, Derek Fisher, Billy Hunter and Ron Klepner sitting in for the Union. 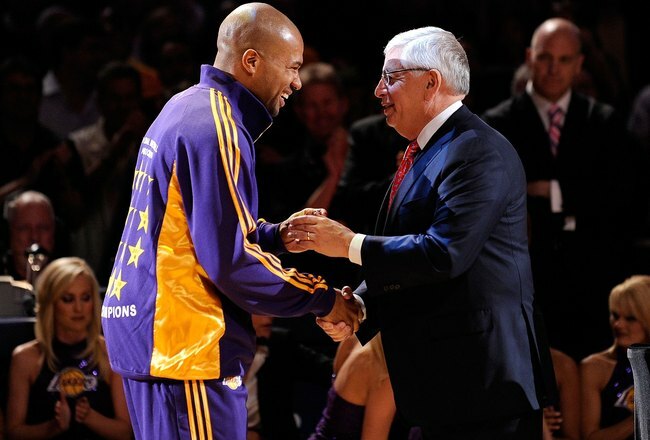 David Stern indicated that having a small number helps with negotiating. Well, we’re not close to an agreement. The owners still want a reduction of 7.6 billion dollars over six years in players salaries, the players are still willing to give up 630 million dollars over that time. There are other issues, but until this major one is resolved, there’s no hope for the NBA season. For now, the sides seem to be pleased about the talks, just being back to talking. Both sides have also declared that the whole PR festival, blaming each other over the media, throwing numbers, lies and counter numbers, Stern’s salary, Stern’s vacation schedule. It’s good that we’re meeting, said David Stern. We don’t have any deadlines in mind, we just have meeting and discussions in mind. He also said that there’s clearly enough time to reach a deal that will allow the regular season to start on November 1. Training camps are supposed to being on October 1, and with the clock advancing forward, not backwards, some suggest that September 15 is the last day to reach an agreement and not lose anytime from the regular season or the pre season. The only agreement that came out of Wednesday’s meeting was to keep talking and not slow down the pace. It’s been almost a month since the Union and League reps met. Lets hope that yesterday’s six hours at least kicked this thing into some sort of motion.